Microsemi Corporation, a wholly owned subsidiary of Microchip Technology Inc., today announced its newest network synchronization integrated circuit (IC) product family for Synchronous Ethernet (SyncE) and IEEE™ 1588 timing and line card applications. Targeted for upcoming 5G wireless equipment and network infrastructure, the new product family provides advanced phase measurement and adjustment capabilities which simplify next-generation transport and wireless equipment design. These capabilities also enable equipment to achieve the stringent phase alignment requirements which are down to 130 nanoseconds (ns) across the entire network. As next-generation networks will move greater amounts of data providing increased connectivity and must do so with lower latency and at a lower cost, Microsemi’s new network synchronization IC product family provides the feature set necessary to address these challenges. The devices’ precise timing capabilities to monitor, measure, tune and calibrate to the picosecond enable equipment manufacturers to address the tenfold increase in phase alignment accuracy required by 5G networks. According to market research firm IHS Markit, worldwide acceleration in 5G developments has pushed the 5G forecast substantially from $59 million in 2018 to $11.3 billion in 2022. Microsemi’s new product family is ideal for a variety of 5G applications, including 5G baseband, radio units, distributed units and centralized units. These new devices can also address the demands of mobile fronthaul/midhaul/backhaul, including microwave/millimeter wave and service provider switches and routers. Microsemi’s new product family includes SyncE packet clock network synchronizers—ZL30671, ZL30672 and ZL30673—which offer one to three channels of SyncE packet clock synchronization, and the family’s ZL30681, ZL30682 and ZL30683 offer one, two or three independent channels of SyncE clock translation while the ZL30256 is able to attenuate and translate frequencies up to three channels. 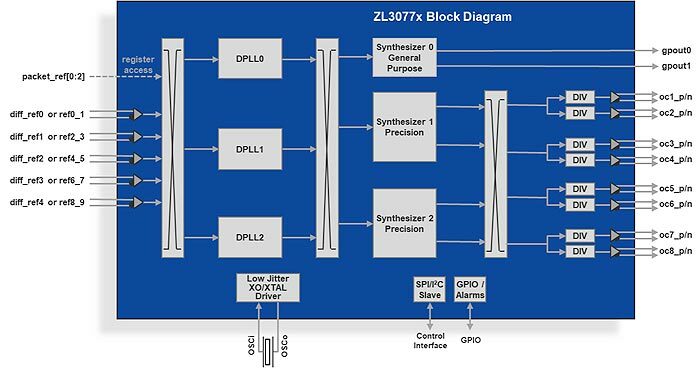 Its IEEE 1588 and SyncE packet clock network synchronizers—ZL30771, ZL30772 and ZL30773—offer one to three independent timing channels of a combined hardware and software platform including IEEE 1588-2008 Precision Time Protocol (PTP) stack and synchronization algorithms.